FLOWERY BRANCH, Ga. (AP) — It was just another routine throw in practice, a rookie quarterback tossing the ball to a rookie receiver. When the two failed to connect, Julio Jones stepped in. Do it again, he ordered. Jones’ leadership qualities could take on special importance this season. Calvin Ridley was the Falcons’ first-round pick . Like Jones, he went to Alabama. Like Jones, he plays receiver. The Falcons are counting on the rookie to quickly carve out a role in an offense that has plenty of weapons but needs to find ways to lure coverages away from Matt Ryan’s favorite target. Jones is certainly doing his part of help Ridley — and, by extension, his own pass-catching prospects. Early in Tuesday’s practice, undrafted quarterback Kurt Benkert — a longshot to make the team — was working with Ridley on a particular route. They haven’t gotten a lot of time together in practice, so it wasn’t all that surprising when the two were out of sync. That wasn’t acceptable to Jones. 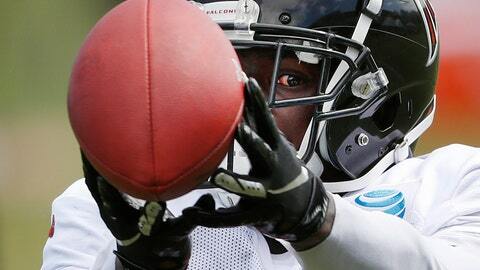 Even when Ridley makes a catch in practice, he usually has Jones in his ear. While Jones took some heat from fans and the media for skipping offseason workouts and a mandatory minicamp in a bid to land a new contract — he agreed to report to training camp only after the team adjusted his deal for this season and promised to renegotiate in 2019 — there is no question about the commitment to his teammates. He shows it with his willingness to work with anyone who has a desire to get better, whether it’s a first-round pick such as Ridley or a fringe player such as Benkert. Jones is impressed with Ridley’s work ethic and potential. While Jones has enormous physical skills, he knows his success as a receiver goes beyond his speed, size and hands. He keeps telling the rookie to pay attention to what’s going on around him. The eyes might be the most important attribute of all. To give all the rookies an idea of what they’re up against in Friday’s first preseason game against the New York Jets, Jones showed a tape of his very first exhibition contest against the Miami Dolphins in 2011. Someone asked Jones for a critique of that younger version of himself.